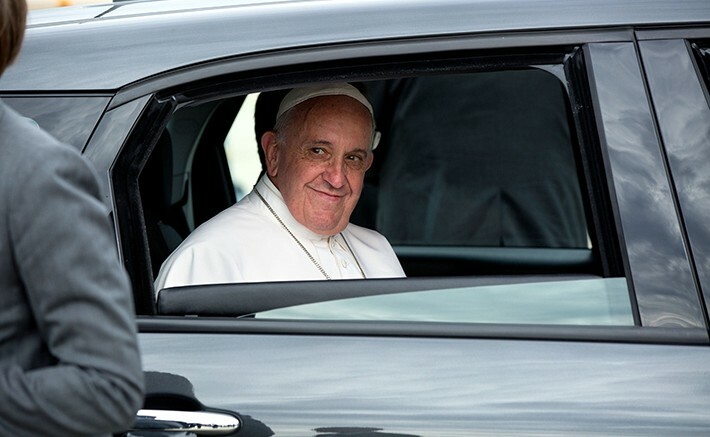 Pope Francis sits in the back seat of a Fiat as he is driven away from Andrews Air Force Base on Sept. 22, shortly after arriving in the United States. The Pope visited Washington, New York and Philadelphia (Photo courtesy of the White House). Even after the wall-to-wall media coverage of the Pope’s visit to the United States, he is still very misunderstood. Pope Francis is often portrayed, in the press, as a Pope who wants to bring the Catholic Church in line with modern American liberalism. This misconception is based in a profoundly Americentric view of the world. What the Pope has been trying to do, rather, is to help people understand that Christianity is a religion which should never be too comfortable or content with existing social and political structures, ideologies and norms – whether we call those conservative or liberal. During the first three centuries of Christianity, it was impossible for Christians to openly practice their faith and remain respectable Roman citizens due to bloody persecutions. After Christianity was legalized in 313 by the Emperor Constantine and most of Europe converted to Catholicism, the church had to make compromises with existing power structures. Pope Francis has stated that he is not interested in reversing the Catholic Church’s opposition to artificial contraception or abortion. His attacks on “the idolatry of money” and corporations (which he called “new colonialists”) are also not revolutionary. Francis’ predecessors going back to Pope Leo XIII in 1891 have consistently defended the rights of the poor and of immigrants and condemned the excesses of capitalism. But in choosing to focus on issues like the environment and income inequality, the Pope is sending the powerful message that authentic Christianity can be as uncomfortable with modern conservatism as with liberalism. The Pope wants a Christianity that both goes to Mass and works for social reform, that cares about both abortion and climate change, that both prays and feeds the poor. Most of all, he wants a Christianity that leaves the church building every Sunday to spend the week reaching out to those who are victimized and hurt. “I see the church as a field hospital after battle,” the Pope said, according to a translator, in an interview with America magazine in 2013. But Francis is unequivocal on his conviction that people are victimized both by the materialism and economics defended by the right wing and the secularism and relativism countenanced by the left. The Pope sees that with institutional Christianity in decline, the only way it can be saved is if it divorces itself from ignoring or excusing social injustices and presents a truly alternative way of living to a world which often doesn’t slow down from competition to think about what’s best for both the soul and the common good. Whether he’ll succeed or not, it’s a bold vision. Be the first to comment on "Opinion: Pope still misunderstood after U.S. trip"